1. 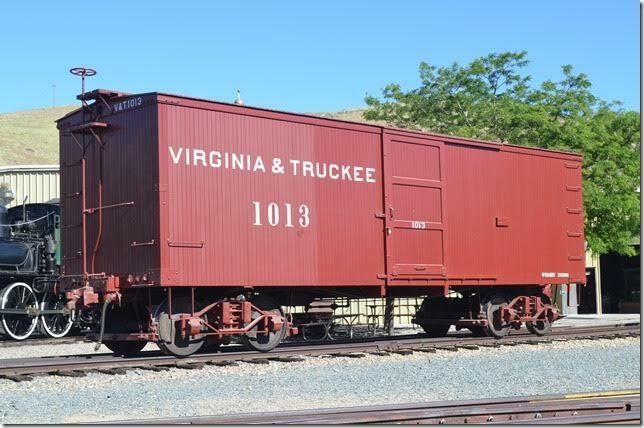 Virginia & Truckee (V&T) box car 1013 was ordered in 1874 from Wells, French & Co. of Chicago. The car’s inside dimensions were specified to hold bales of hay shipped from Carson City. No. 1013 was rebuilt in 1909 and sold to Paramount Pictures in 1938. No. 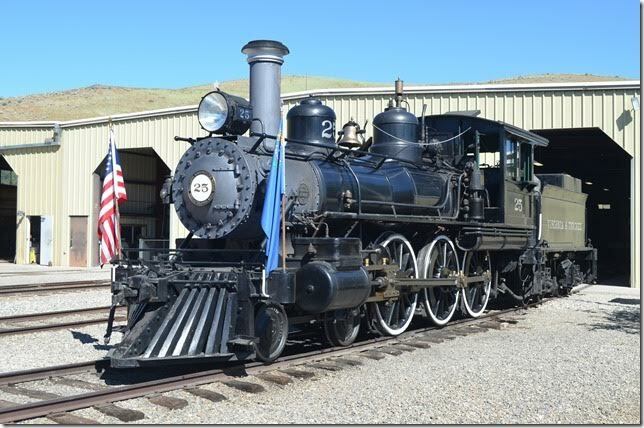 1013 was acquired by the State of Nevada in 1971 and restored to its 1917 appearance. I love vintage rolling stock! 2. 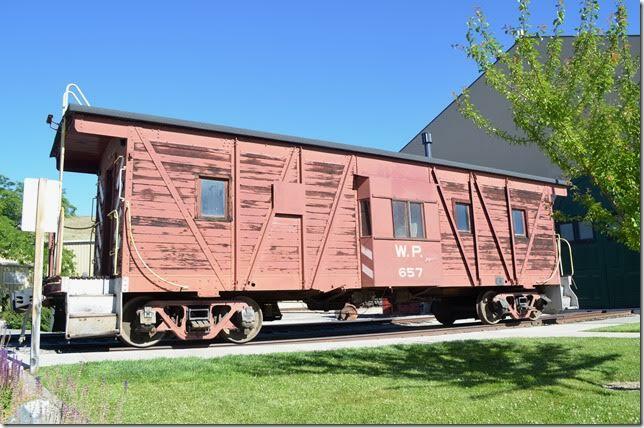 Western Pacific composite caboose 657. 3. 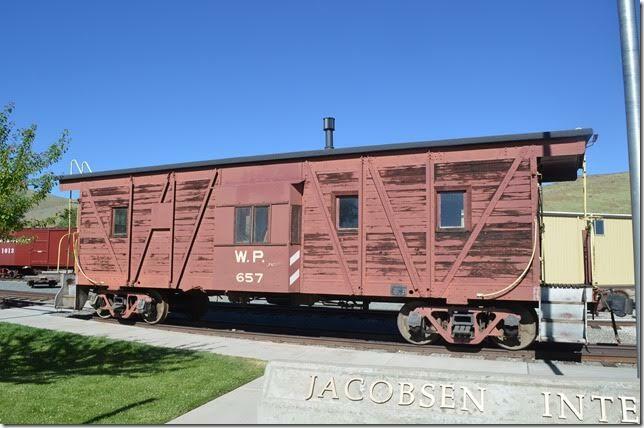 Western Pacific composite caboose 657. View 2. 4. V&T coach-combine No. 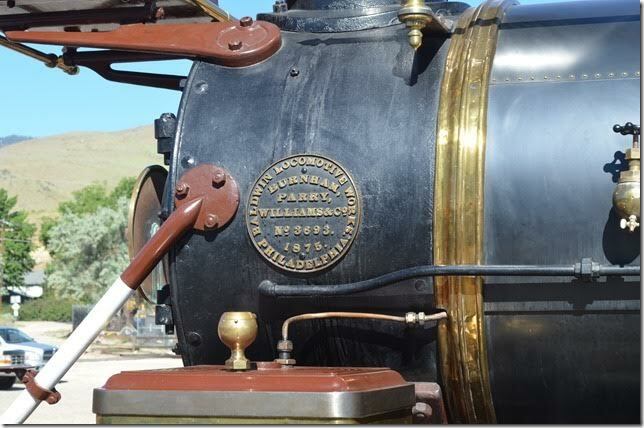 9 was purchased from Kimball Manufacturing Co. of San Francisco in 1873. 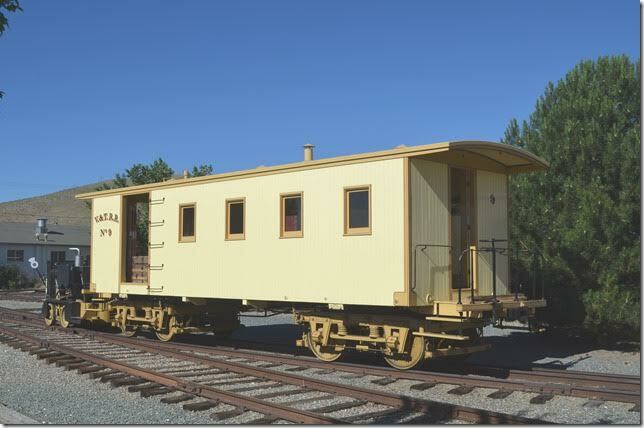 It was remodeled as a coach, caboose and later camp car. It and sister No. 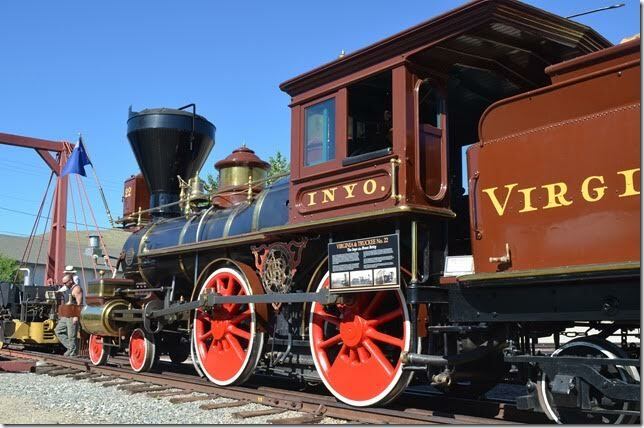 10 were sold to Paramount in 1938 and used in the movie “Union Pacific.” The State of Nevada acquired No. 9 in 1971 and restored it to its 1873 appearance. Both No. 9 and No. 10 are in use, but No. 9 requires special handling as it is still equipped with link-and-pin couplers and hand brakes. What a beauty! 5. V&T combine No. 9. View 2. 6. 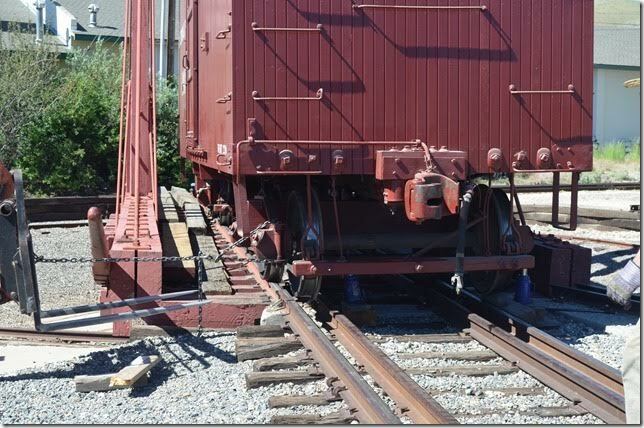 Being turned on the “Armstrong” turntable before being pushed inside. 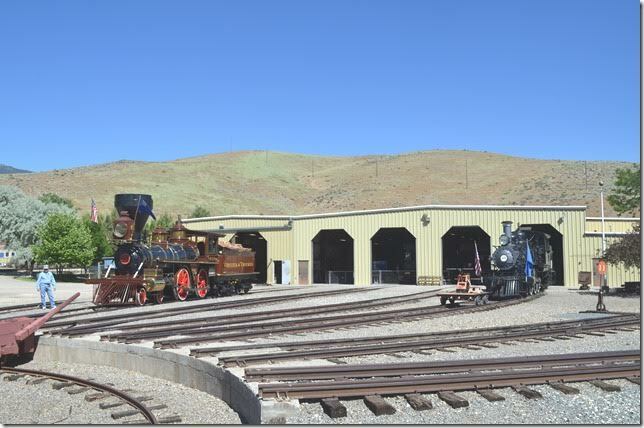 The turntable was constructed at the site, presumably from vintage drawings. 7. V&T combine No. 9 being pushed. 8. 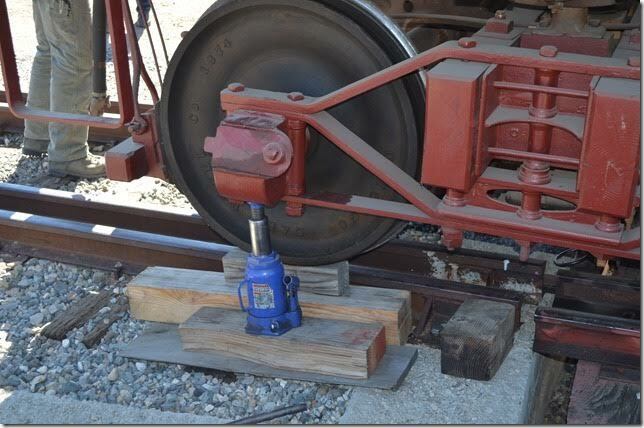 This implement prevents the Armstrong turntable from becoming misaligned. 9. V&T No 22 Inyo. 10. No. 22 was built by Baldwin in 1875. “Inyo” is an Indian word which means “dwelling place of a great spirit.” No. 22 also appeared in many Paramount movies. 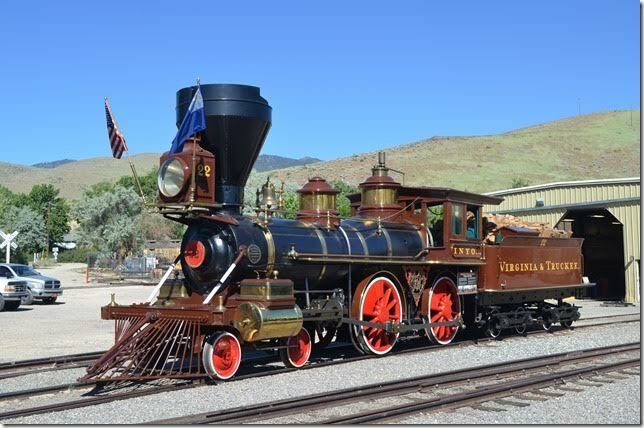 It was acquired by the State of Nevada in 1974 and restored to its 1893 appearance. It is operational, and the boiler is certified to operate at 75 p.s.i. (originally 130 p.s.i.). 11. V&T 22 Inyo. View 3. 12. V&T 22 Inyo. View 4. 13. 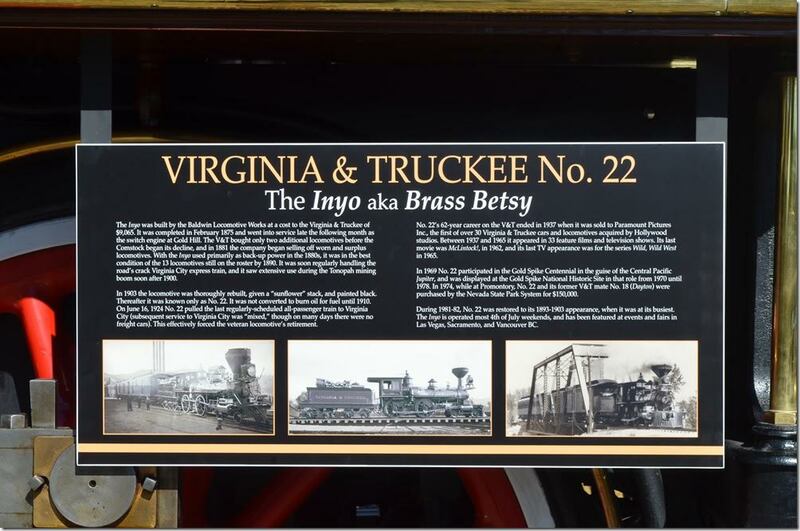 V&T 22 Inyo informational display plaque. 14. V&T 22 Inyo plate. 15. V&T 22 Inyo. View 5. 16. V&T 22 Inyo on turntable. 17. V&T 22 Inyo on turntable. View 2. 18. Opps! Got it on the ground! Go get some jacks, a chain and some blocking. 20. No problem. This is how its done. Rerailing V&T 1013. View 2. 21. Rerailing V&T 1013. View 3. 22. Rerailing V&T 1013. View 4. 23. 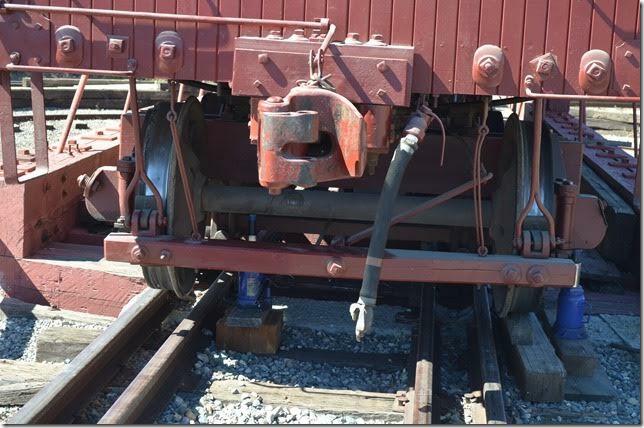 Using a fork lift, they gradually pull the jacked-up wheels back onto the track. No problem. View 5. 24. 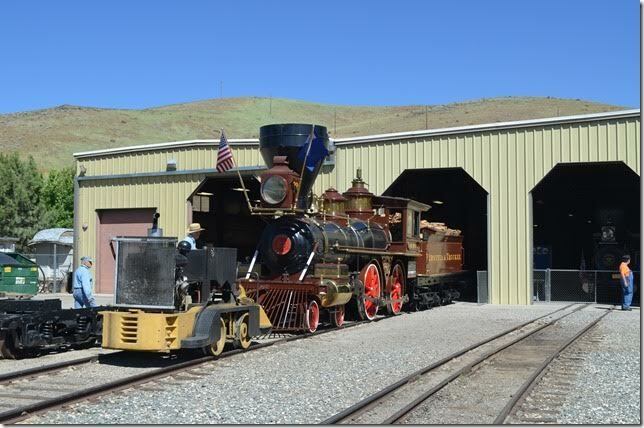 The 1013 is pushed into the museum using the modified Plymouth shop goat. Note the stub switch and the “harp” switch stand. 25. V&T 4-6-0 No. 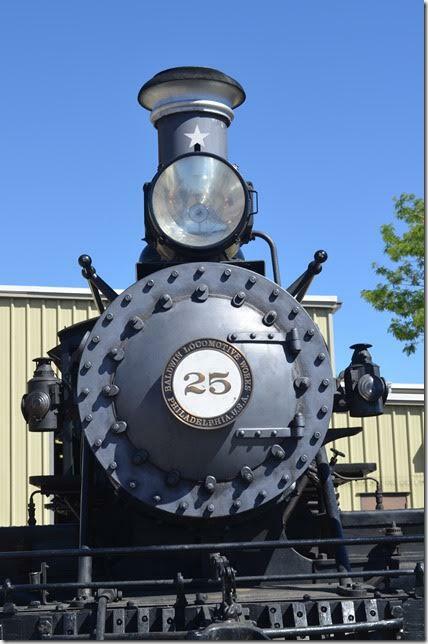 25 was built by Baldwin in 1905 for passenger and freight service. It was built as a coal burner but converted to oil in 1907. No. 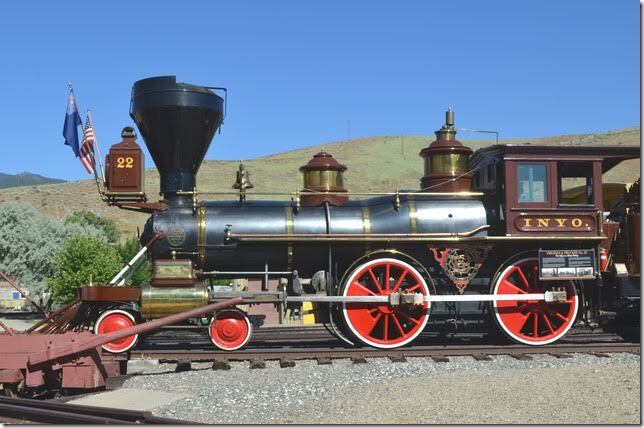 25 handled the last regular train from Virginia City in 1938. It was later sold to Metro-Goldwyn-Mayer studio. 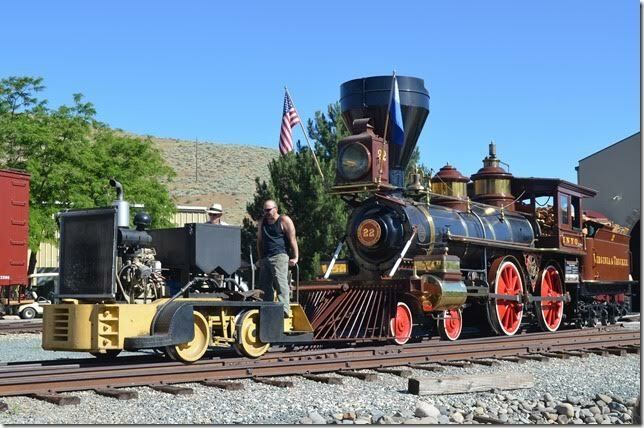 The State of Nevada acquired 25 in 1971 and returned it to operating condition. 26. V&T 25. Front side. View 2. 27. V&T 25. Head on. View 3. 28. V&T 22 and 25. 29. 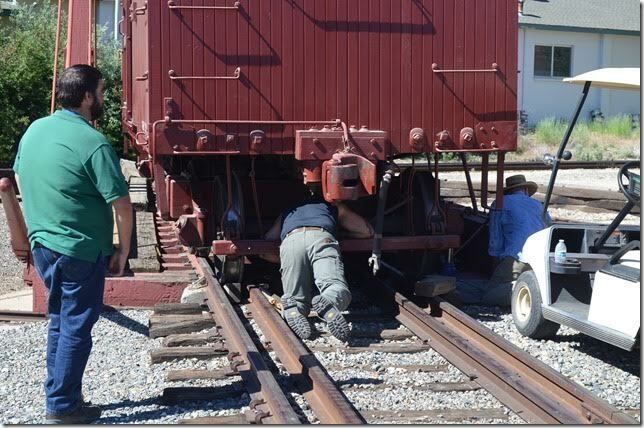 Using an adapter on the shop goat to move the link-and-pin equipped front coupler of the “Inyo.” Keep those fingers in the clear!! 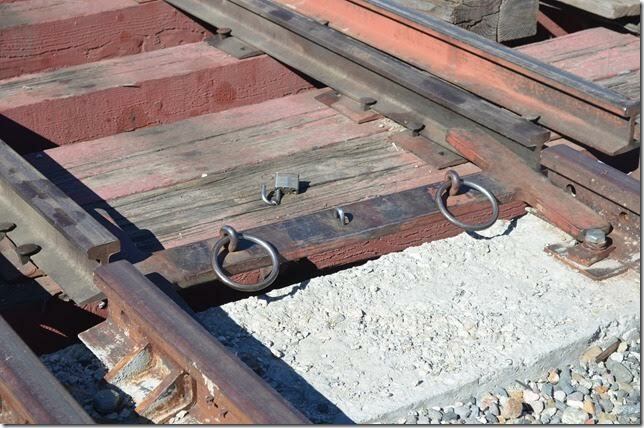 (An occupational mark of 19th century railroad brakemen!). 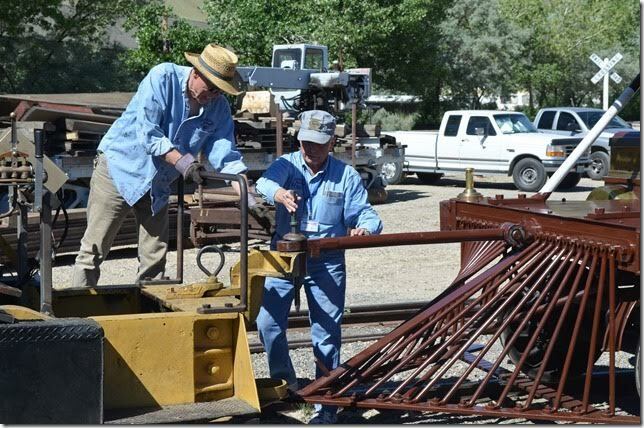 The gentlemen wearing the straw hat, had tipped me that they would be moving equipment around and putting some in the shop or museum. I therefore stayed outside instead of going inside, thus allowing me to witness these movements. He was quite helpful. 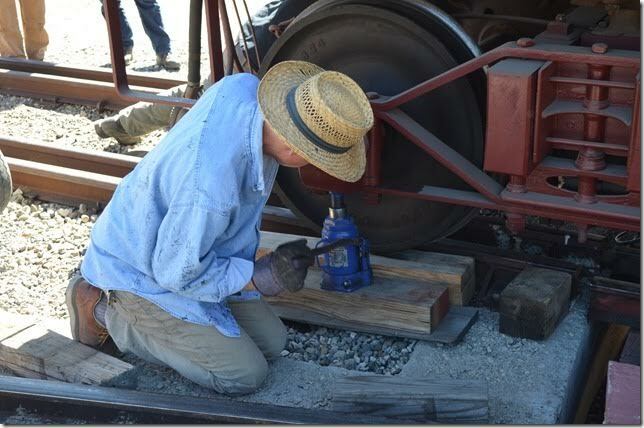 The gentleman dropping the pin is a Pennsy fan from Lewistown PA coupling to V&T 22. 31. 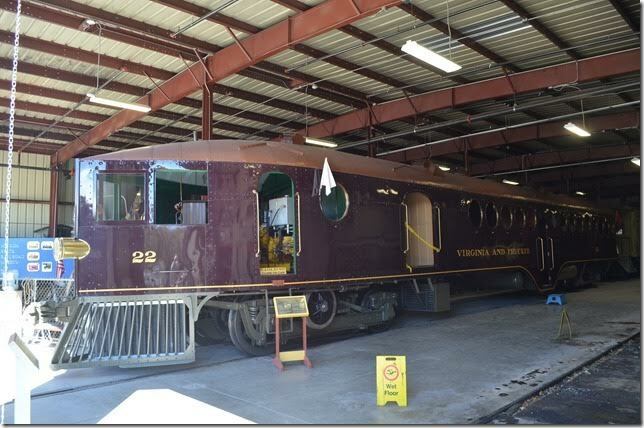 V&T McKeen Motor Car 22 was acquired in 1910 to provide additional passenger service between Carson City and Minden and later to Reno. 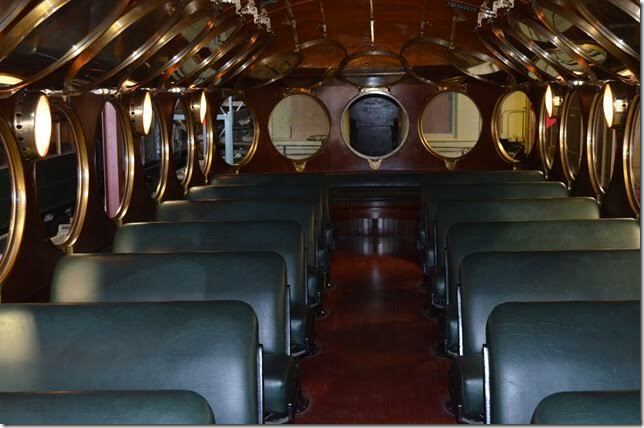 In 1946 the body was sold and used as a diner! 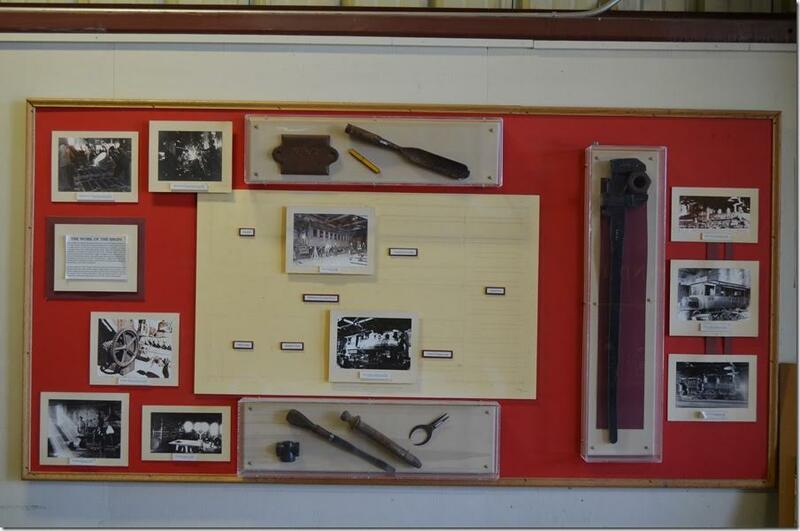 In 1996 Al’s Plumbing Supply donated it to the museum. It is now operational. Frankly I’m not that interested in “doodlebugs”, but this one shook me up! 32. 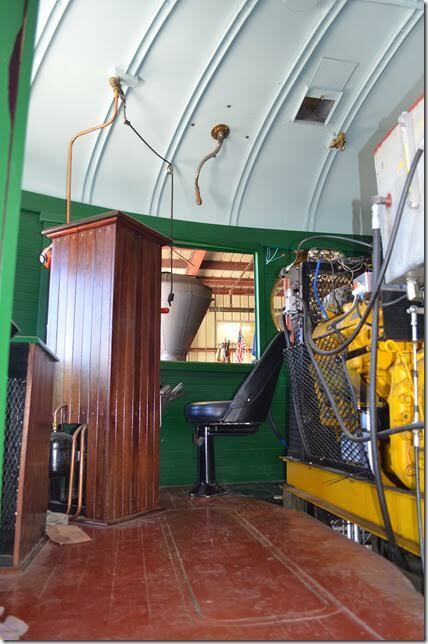 The control stand and engineers seat for V&T McKeen Motor Car 22. A new Caterpillar engine now powers the car. 33. 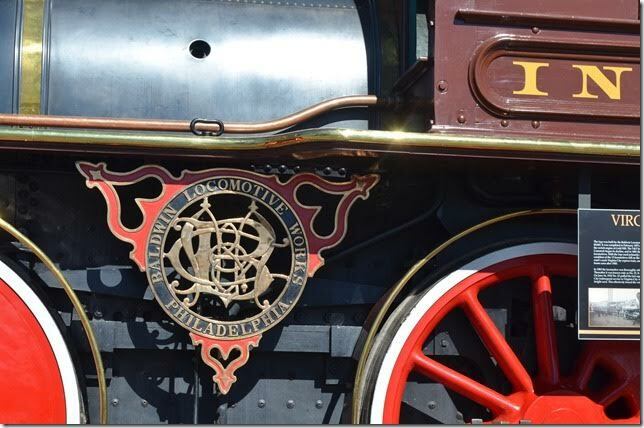 V&T McKeen Motor Car 22. 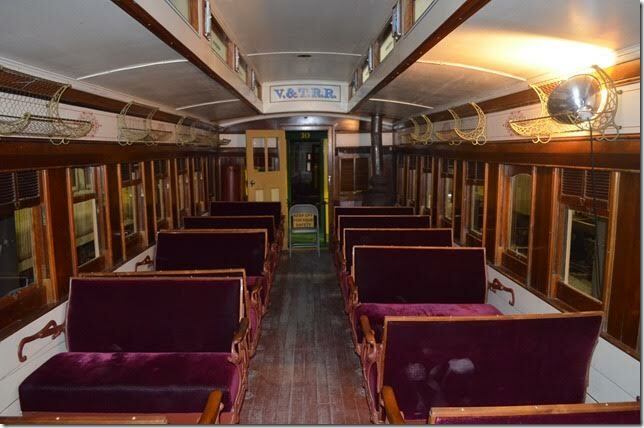 Looks very comfortable for a conveyance intended for branch line service. 34. 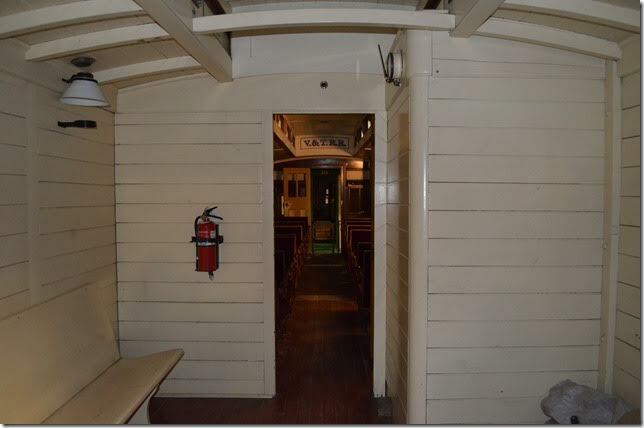 The baggage/mail compartment looking forward through the passenger area of V&T combine coach no. 8. 35. Interior of V&T combine coach 8. No. 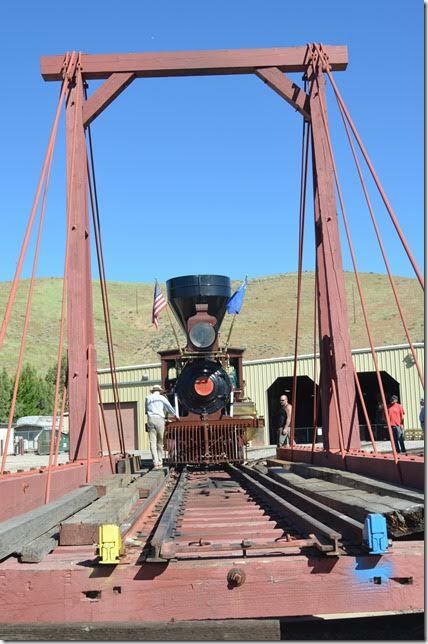 8 was built by the V&T in 1869 and remodeled several times. V&T sold it to M-G-M in 1947 for movie use. 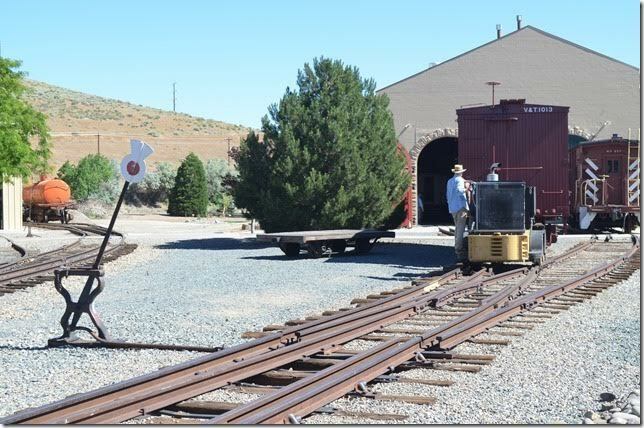 The State of Nevada acquired the restored car in 1988, and it continues to see active service. 36. 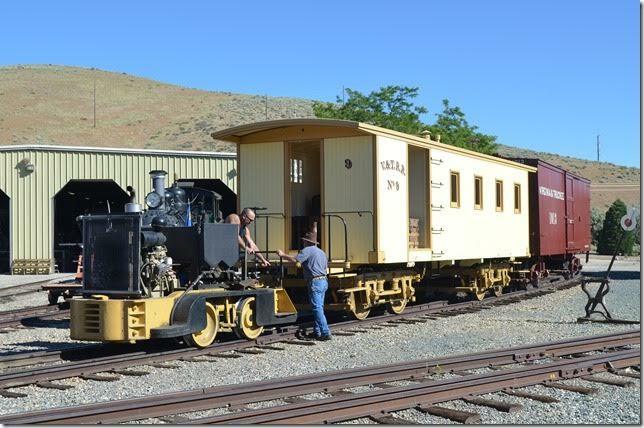 V&T coach 10 (Kimball Manufacturing Co. 1873) and Nevada Copper Belt caboose 3. 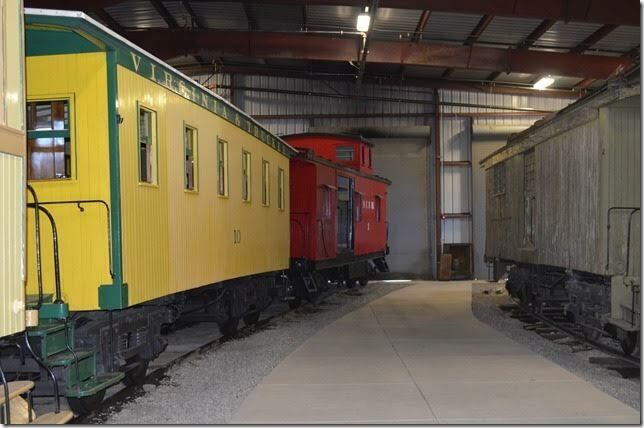 NCB 3 is possibly ex-Hocking Valley and built in their Logan OH shop per information while rebuilding the car. 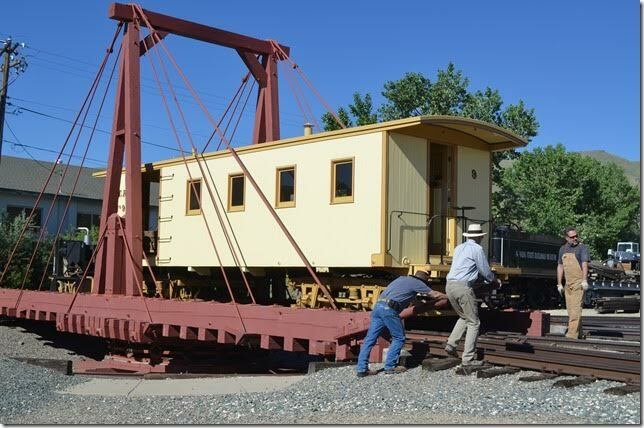 NCB purchased the caboose from General Equipment Co. of New York in 1928. 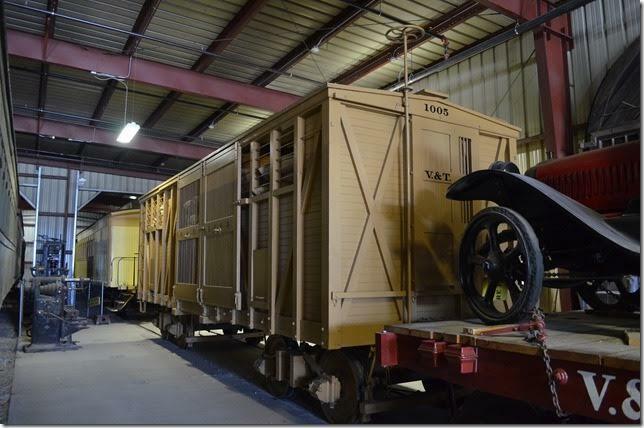 V&T acquired the caboose when NCB abandoned in ‘47. It was acquired by the museum in 1982 and restored to its 1938 appearance. It is in operating condition. The car on the right is possibly V&T express-mail 21. No. 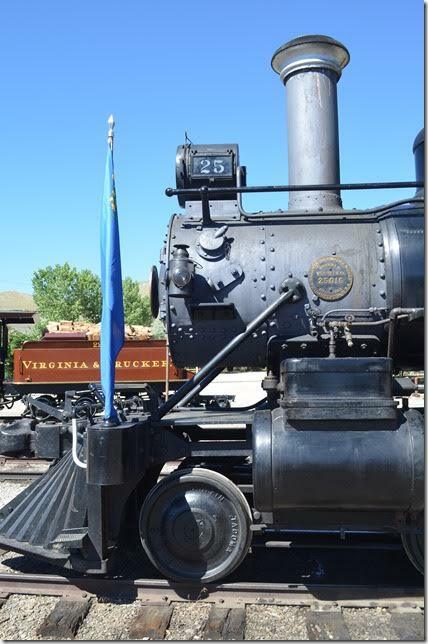 21 was built by the V&T in their Carson City shop circa 1906. No. 21 was sold to Paramount Pictures in ‘38 for movie service. It was acquired by the museum in ‘88. 37. 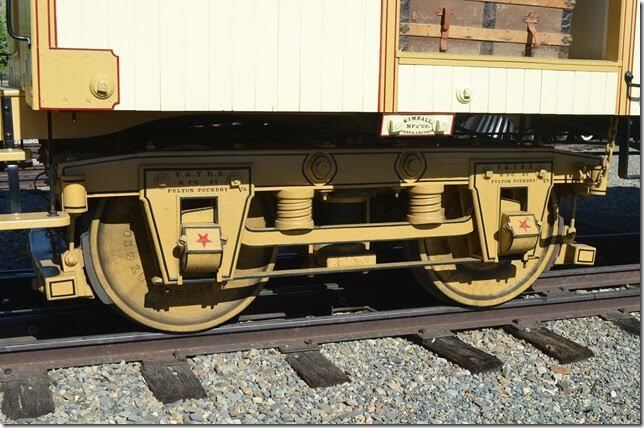 V&T combination box car 1005 was built by the Central Pacific ca. 1872 for the V&T. This multi-purpose car was equipped with two sliding doors, one vented and one closed. They were used for shipping merchandise, livestock, perishable fruits and vegetables. When shipping merchandise the vents could be closed. 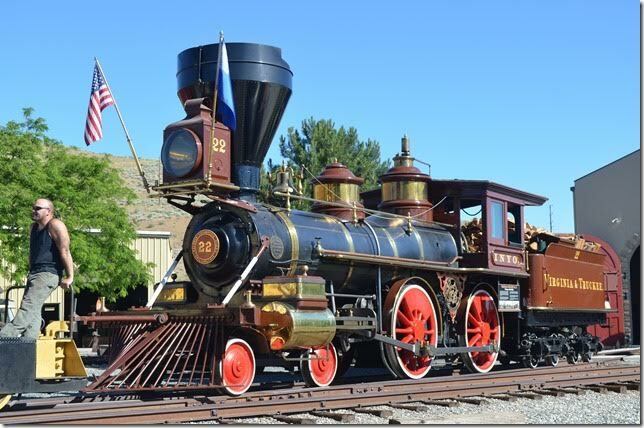 It was sold to Paramount Pictures in 1938 and acquired by the State of Nevada in 1971. It was rebuilt to its 1872 appearance. 38. Display of V&T shops in Carson City. Development of the Comstock area of Nevada. 39. 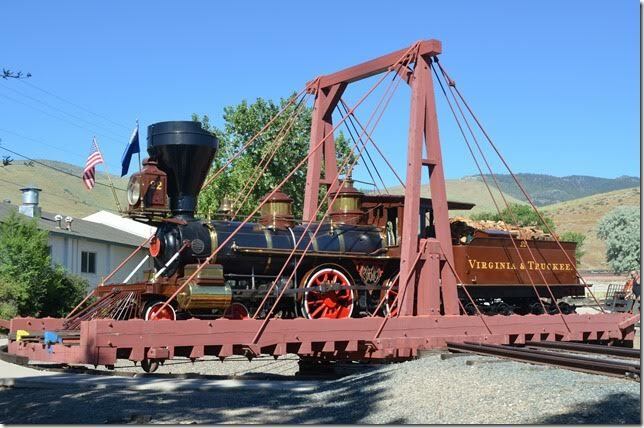 V&T 4-6-0 27 was the last engine acquired by the railroad. It was built by Baldwin in 1913. No. 27 pulled the last V&T train in 1950. 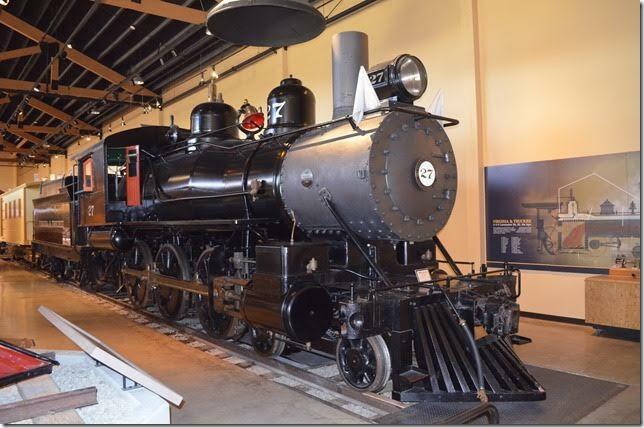 It was been cosmetically restored by the museum to its 1941 appearance.